I am always looking for bargain technical clothing and was lucky my wife came across the Triple Star packable down hooded jacket during a shopping trip at Costco. I have never heard of the brand nor is there any information online about Triple Star. I assume it is privately labeled exclusively for Costco. $30 for a down jacket is a great buy, especially a lightweight model with a hood and stuff sack. It appears perfectly suited as an insulating layer during the shoulder seasons or for climbing the Pacific Northwest volcanoes. It is only available in boy's sizing, but the XL size is comparable to a men's small to medium and fits me great (not too short in the arms like a typical XL boys garment would be). The shell and lining feel like untreated lightweight nylon. The stitching is decent, but I doubt it would hold up to abuse. As an insulating layer, I suspect it will hold up fine. There were a couple of jackets in the store with down stuck in a seam or two, but overall the jackets don't appear to leak any down. The hood has an elasticized hem (non-adjustable) as well as the sleeves and bottom of the jacket (also non-adjustable). I find them to be perfect for my frame. The Triple Star down jacket feels warm, but the real test will come on a future climb. I had the opportunity to test the Triple Star Down jacket on a snow camping trip to Shellrock Creek. The temperature was around 30°F with snow on the ground and no wind. I wore the jacket over my mid-weight base layer and was remarkably warm while remaining stationary. I found the jacket very comfortable and liked how the hood fit without needing any adjustment toggles. While walking around, the jacket became too warm and I had to unzip it. The pockets work very well for warming cold hands. I noticed instant warmth when using the pockets. The only downfall I have found so far is that the Triple Star Down jacket leaks a little bit of down (inside and outside). I only noticed a few feathers, so I am not worried about it at this point. See Shellrock Creek adventure where the Triple Star Packable Down Hooded Jacket was used. 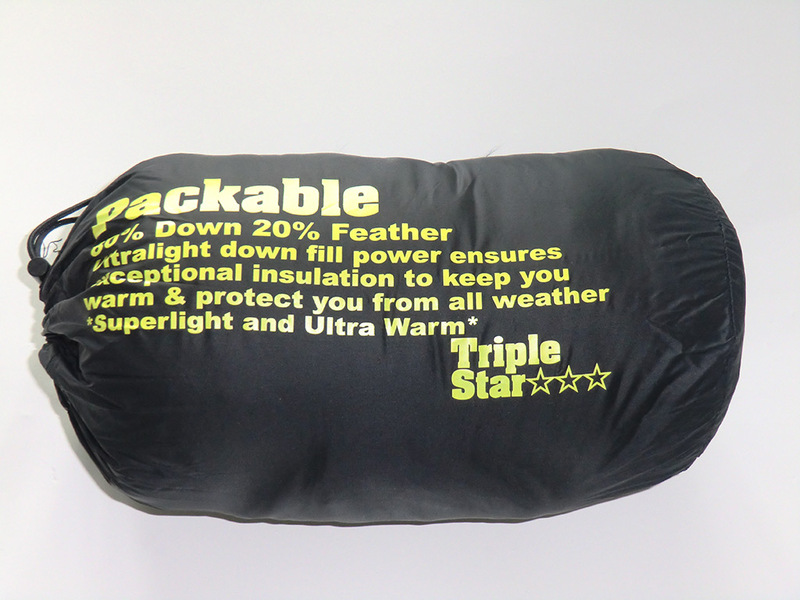 After using the Triple Star packable down hooded jacket for over a year, I am still very impressed with its value. I take it with me on every climbing trip. It provides an extra insulating layer when conditions get really cold. It has held up very well and looks the same as when it was new. My only complaint is that it leaks a little bit of down, but many down garments do. I love how small it packs down and how well if lofts up when wearing. Costco has a new 800 fill down jacket in men's sizing this year for over twice the price. It doesn't even have half the loft as my Triple Star jacket. See Mt Hood, Another Mt Hood Climb, and Mt Hood Cooper Spur Climb adventures where the Triple Star Packable Down Hooded Jacket was used. I highly recommend the Costco Triple Star packable down hooded jacket for anyone who can fit into it (children and smaller adults). 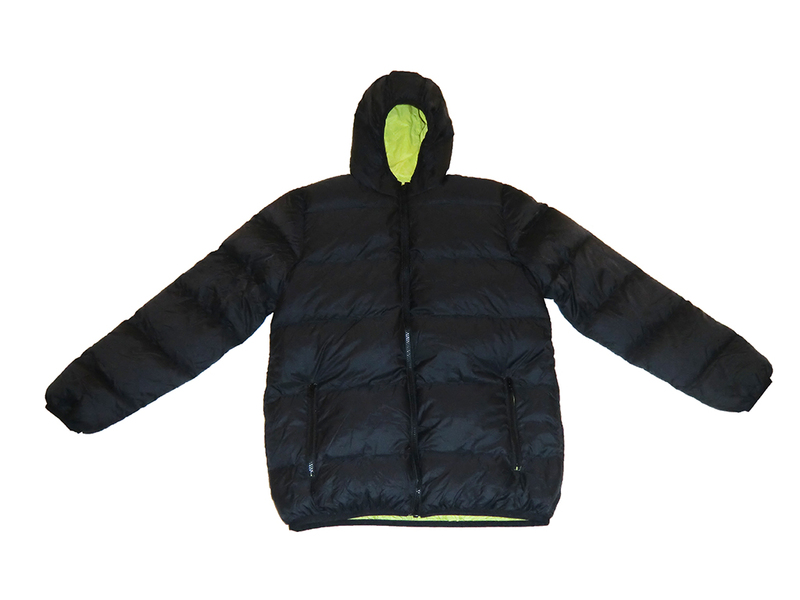 It is a fantastic insulating layer underneath a hardshell jacket (for rain/snow/wind protection). I bought a thinner version of this coat at BJ's in a ladies size---the loft is not as impressive.... but it also has less bulk and a more tailored profile. It is as comfortable as hell...but I don't think will be warm enough for skiing or real cold temps. I wore it out in the wind the other day and it felt quite wind resistant. Thanks for the comment. I am looking forward to trying this jacket soon. I didn't end up needing it on my last climb. I have only seen the Triple Star Down Jacket sold in Costco stores. It is only available in boys sizing, but the XL fits me and the L fits my wife. Has anyone had the jacket smell real bad after washing? My kids love these jackets! I washed and dried them last night and today OMG they smell like fish...I am rewashing the tonight and hopefully it's gone. of course it smells-it's down! LOL You obviously have not ever washed a down garment or comforter yourself. Down smells AWFUL when wet and will continue to smell until it is FULLY dry. So the problem isn't fabric softener, it's the fact that it's not drying. HOWEVER< the reason they don't want you to use the fabric softener is because that's like putting an oil on the feathers, which will prevent them from drying out properly and maintaining the nice fluffy loft. You may very well have ruined the jackets just by that simple act. Just remember, down IS feathers, and they don't smell so good wet even when they're on live birds. The problem is that the feathers take a tremendous amount of drying before they are fully dried--WAY WAY WAY more than just a regular cycle. That's why most down comforter manufacturers don't recommend that you even try cleaning them at home--our home dryers aren't nearly as hot as the ones used by dry cleaners or even the big ones at the local laundromat. There are even some down comforter companies that recommend that you send them away to special dry cleaners who specialize in handling down properly to maintain the high loft (fluffiness).. I recommend just popping them back into your dryer on med-low. Rewashing is not likely to help, although it could get out some of the fabric softener. I just bought this coat for my boys today. I'm wondering if it's waterproof. Does anyone have any ideas? Triple Star Down Jacket - Waterproof? No, the Triple Star Down Jacket is not waterproof. You could treat it with a DWR coating for water resistance, but ultimately it is not designed for wet weather. It is for cool/dry weather or underneath a shell in wet weather. I bought the jacket for my son today. I have no doubt that the jacket will be warm especially just for our area where we don't get too much snow in the winter, but the shell looks so cheap and I wonder if it lasts through a couple washes. I am thinking about returning and get something more durable. Anyone has any bad experience with its durability? Thanks! 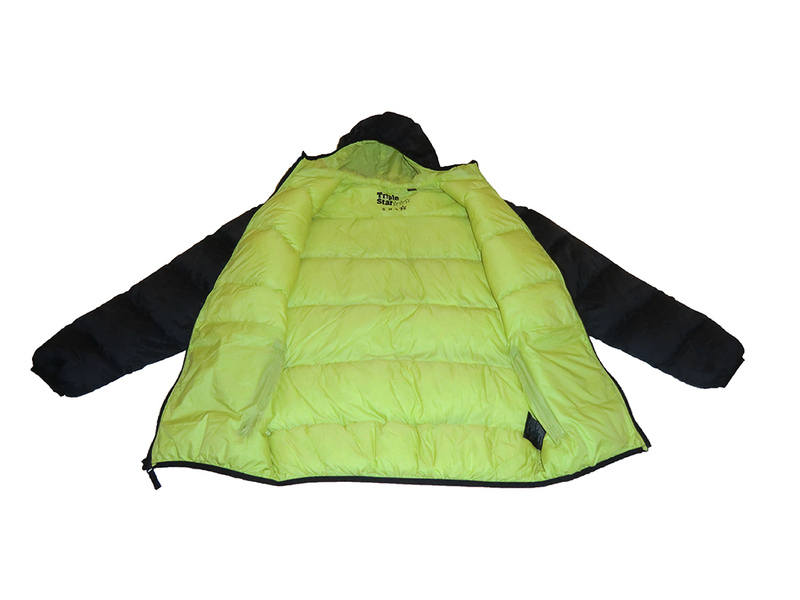 The Tripple Start Down Jacket is made of lightweight materials and down. This type of jacket is not meant to be washed like normal clothing. I never wash any of my down apparel or gear (like sleeping bags). It can be done, but I do not recommend it. This jacket is meant to be an insulating layer. Your kids should wear it over a shirt and then have some sort of shell over it. If they do happen to get it dirty, just take a damp cloth and clean the dirty area. We bought these coats for our two grandkids last fall from Costco, and they have LOVED them. They are so soft, and especially our granddaughter has worn hers everywhere. They live out in the country, and evidently while wearing her coat she got into some branches (her words). Now her coat has holes throughout and the down is emptying from each section where the holes are. These coats are comfortable and I would buy them again, but I am not sure they should be worn outside when playing rough or getting into thorns, bushes, or trees. Another thought is to layer a shirt over them, but they are already pretty bulky so that would make it worse. Great for wearing to school or anywhere children won't encounter sharp objects. I bought a Triple Star down packable coat for my grand daughter. It is just what we were looking for. However, we had trouble getting the size sticky strip down the front left side off. And now there is a sticky residue left on the coat. I tried to remove it with water, and with Windex, but am afraid to use anything else for fear of ruining the material. What can I use to get off the sticky residue and not hurt the material? I have personally never had this problem. My first through would be to take a piece of tape (like duct tape) and gently try to remove the residue with that. I have used this method to get sticker residue off other surfaces. Other than that, I would be hesitant on using any chemical cleaner on a down jacket. My 5 year old son loves this coat in green. He is 5 - so it got dirty. I read the washing instructions and followed them, and now the down is in little wads in each section, exactly what I thought would happen. I washed it anyway after I read the instructions thinking it wouldn't. I'm trying to seperate them thru the coat and cal tell they are still pretty wet on the inside. i'll try drying it again and see if it fluffs up again or return it later tonight. Disappointing! we have these jackets for our 9 yr. old twins. I did the same thing...washed them, and the down ended up in little balls. if you pull the little balls apart thru the nylon and throw it back in the dryer on a med. setting. it will fluff back out. you may have to do this two, or three, times....but, it works. my girls LOVE these jackets ! this is our second winter using them. they have held up really well. although this is the first time i have washed the whole jacket. (usually just do a spot clean) they are very, very warm, and great for school. clump and help speed up the drying process! I bought this jacket XL from Costco for $30. Tried in top of the Mt Adams at 20F with 50 MPH wind. Worked really well with/ without hard shell jacket. i just took this jacket out of the wash. i washed and dried with a regular batch of clothing, dried on medium heat. it came out perfect. i use wool dryer balls in my dryer so they help to fluff the down, that might be a good tip for others who had trouble. a good tip for anybody, anyway, since dryer sheets are super toxic, and often the residues left behind on the heating element can lead to dryer fires.